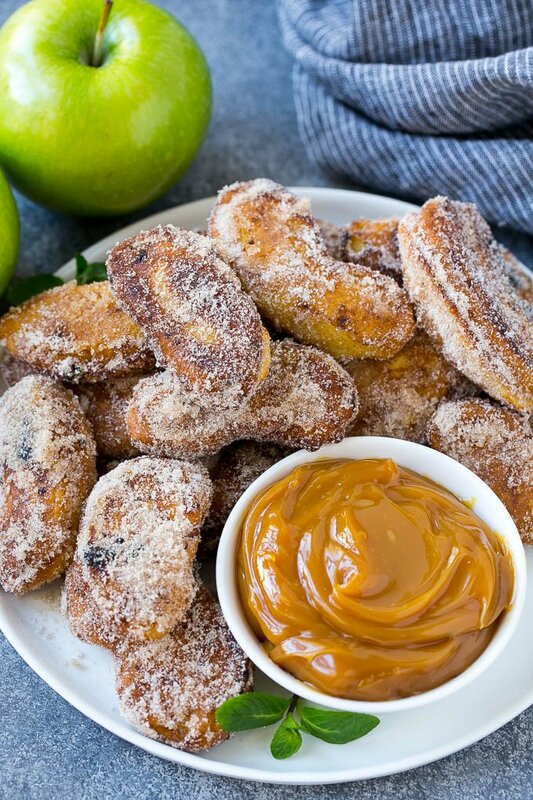 These apple fries are battered, cooked until golden brown, then coated in cinnamon sugar and served with caramel dip. The absolute BEST way to eat apples! Forget potato french fries, these apple fries are where it’s at! 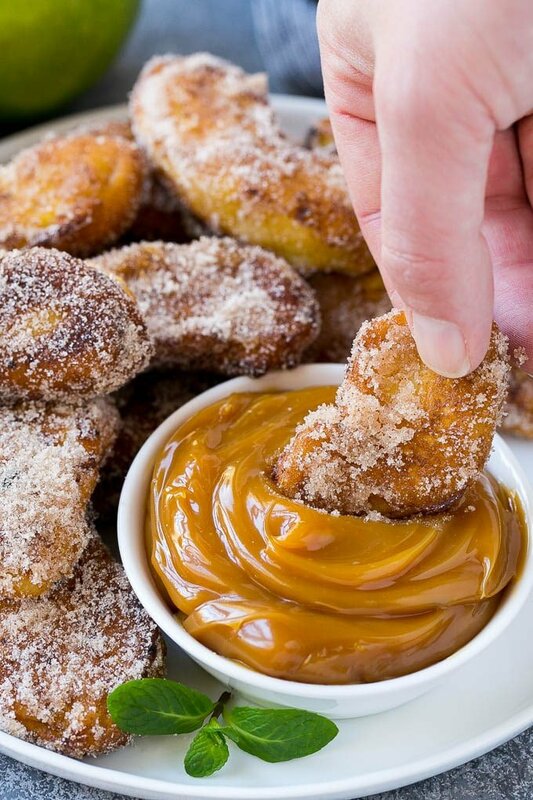 Part apple pie, part churro, these treats are the perfect dessert or party snack. These apple fries are one of the best things I’ve ever eaten, this recipe is a MUST TRY. 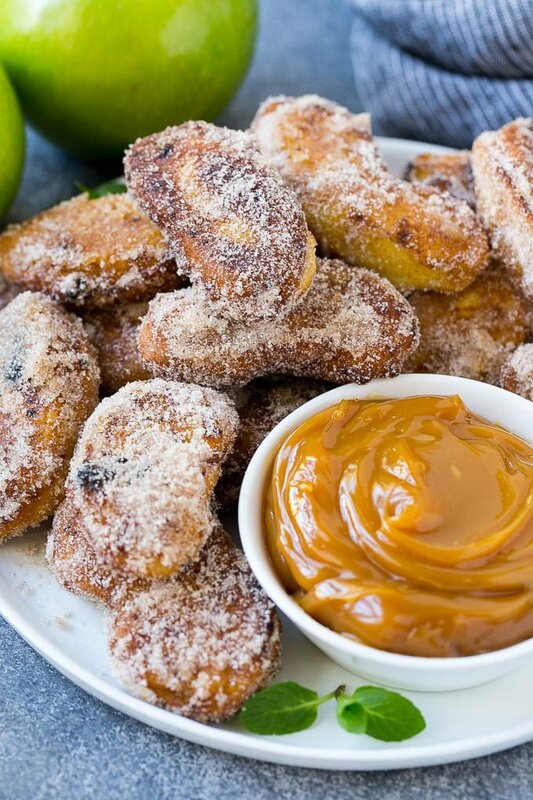 It’s apple slices coated in batter, then fried and rolled in cinnamon sugar. While these apple fries are incredible on their own, they are even better when you add caramel for dipping. How do you make apple fries? The first thing you need to do to make apple fries is choose your apples. There are countless varieties of apples, but some of them are not suited for frying as they’ll turn to mush. I highly recommend using Granny Smith apples for this recipe, they hold their shape beautifully and are available at every grocery store. 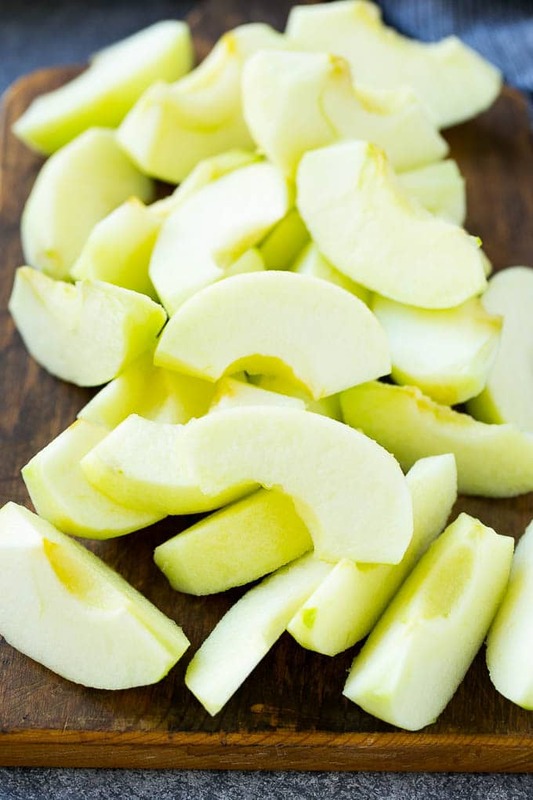 You’ll need to core and peel your apples, then cut them into wedges. Be sure to cut your apples into similar sized wedges so they cook at the same rate. The next step is to prepare the batter, which is similar to a pancake batter. While you make your batter, heat up some oil for frying. Each apple slice gets dunked in the batter then goes into the frying pan until golden brown. Finally, roll each apple slice in cinnamon sugar as it comes out of the fryer; be sure to do this right away as the sugar mixture sticks best when the apples are hot. 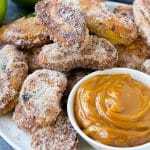 These apple fries almost taste like apple doughnuts, and they’re even better when you add a little caramel to the mix. 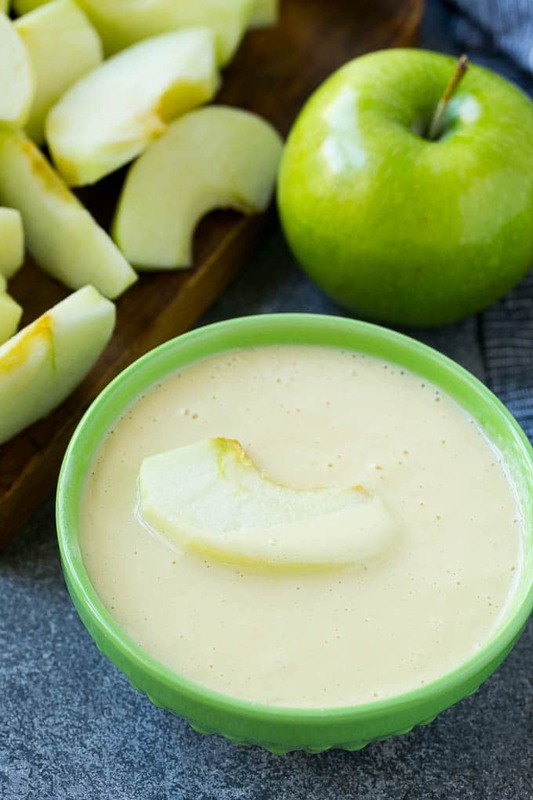 You can use caramel ice cream topping, or a tub of caramel apple dip that’s typically found in the produce section near the fresh apples. These apple fries are definitely a little on the indulgent side, but SO worth it. They always get rave reviews and are super fun to eat. The next time you find yourself with a few apples on hand, give these apple fries a try. Or don’t wait, and run to the store today to grab the ingredients – you’ll be glad you did! In a medium bowl, mix together the milk, flour, egg, baking power and 2 tablespoons of sugar. Stir until smooth. Place the remaining sugar and cinnamon on a plate; stir to combine. Heat 1 inch of oil in a pot to 350 degrees F.
Dip each apple slice into the batter, then add to the pot of oil. Cook 4-5 apple slices at a time for 3-4 minutes or until golden brown, turning occasionally. Remove the apples from the oil and immediately roll in the cinnamon sugar mixture. Repeat the process with the remaining apples. Serve your apple fries immediately with caramel sauce. Garnish with mint sprigs if desired. These look fabulous! My mouth is watering!